Rabbit polyclonal SGLT1 antibody. Validated in WB, IP, ELISA, IHC, Dot and tested in Mouse, Rat, Human, Pig. Cited in 25 publication(s). Independently reviewed in 11 review(s). A blocking peptide for this product is available as ab190911. Our Abpromise guarantee covers the use of ab14686 in the following tested applications. WB 1/500 - 1/1000. Detects a band of approximately 74 kDa (predicted molecular weight: 73 kDa).Can be blocked with SGLT1 peptide (ab190911). Actively transports glucose into cells by Na(+) cotransport with a Na(+) to glucose coupling ratio of 2:1. Efficient substrate transport in mammalian kidney is provided by the concerted action of a low affinity high capacity and a high affinity low capacity Na(+)/glucose cotransporter arranged in series along kidney proximal tubules. Expressed mainly in intestine and kidney. Belongs to the sodium:solute symporter (SSF) (TC 2.A.21) family. N-glycosylation is not necessary for the cotransporter function. 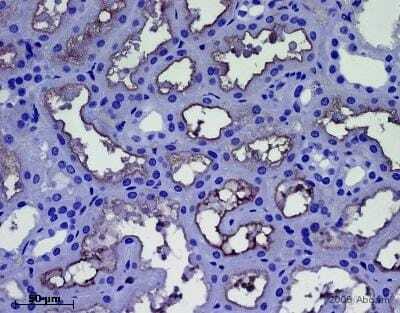 Immunohistochemistry - Anti-SGLT1 antibody (ab14686). Mouse Intestine - SGLT1, Primary Antibody: SGLT-112AP; 1:50 dilution in IHC blocking buffer. DAB (brown) staining and Hematoxylin QS (blue) counterstain. The positive control for Sglt1 was purified rat jujenal brush border membranes solobilized in Solo buffer at approximately 1.5 mg per ml. A 65 ul sample was applied on 8.5% gel, the approximate MWt of rat Sglt varies between MW of 70-74kda depending upon the concentration of acrylamide in the gel. The blot was developed with colorimetric development using alkaline phosphatase conjugate. 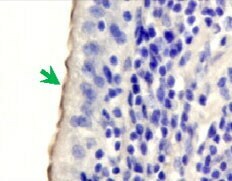 Immunohistochemistry (Formalin/PFA-fixed paraffin-embedded sections) - Anti-SGLT1 antibody (ab14686)Image from Asanuma-Date K et al., J Biol Chem. 2012 Jun 29;287(27):23104-18. Epub 2012 May 14.; Fig 1.; doi: 10.1074/jbc.M111.314658; June 29, 2012, The Journal of Biological Chemistry, 287, 23104-23118. Immunohistochemical analysis of formalin fixed, paraffin embedded porcine duodenum tissue from fasted animals. SGLT1 is stained with ab14686 at 1/50 diluton. Publishing research using ab14686? Please let us know so that we can cite the reference in this datasheet.